Learn the Language online with the same impeccable program of 1:1 classes. A NEW LANGUAGE IS A NEW WORLD! Our Courses can be adapted to suit one’s needs. With the convenience of having the classes at your office or home – at no extra charge! We recommend a maximum of six students per group. The results could be seen in just weeks. We are looking forward to working with you. You will experience the best of their countries in a very enjoyable way, adapting cultural values and local vocabularies. 15% Off Mini Packages when purchase from Dec 10th - Dec 24th, 2018. In today’s economy, speaking more than one language is a much needed skill to beat the competition. While you learn a new language, you’ll also learn a new culture that will help tremendously in business meetings and family gatherings. Globalization brought along the need to communicate effectively in many languages, but Language Factory makes it very easy to master a new language. In fact, learning a new language is easier than you think, and the convenience of having the teacher come to your office or home, makes it less stressful, freeing your mind to absorb the lessons. It helps your business - a new language is a new world! 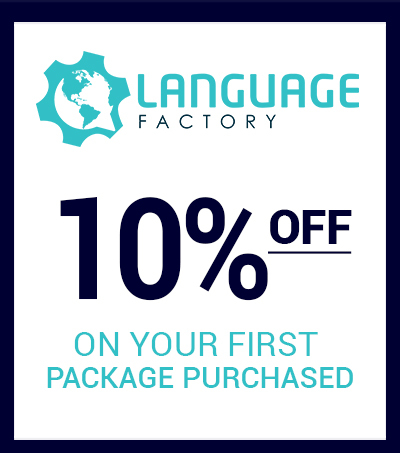 Language Factory provides an exceptional language program, for beginners, intermediate, and advanced students using a conversational teaching style, manufactured especially for you! Language Factory offers a fantastic short course in Portuguese, Spanish, French, Italian, and English especially tailored for business people! Language is art, and it looks great in your resume! Language Factory offers individual and group classes for all kinds of people! For the corporate executives and their staff, the sporty, the language lovers, the adventurous, the curious, for teens, couples, friends, for people of all countries, tastes and flavors! Thank you to all individual and corporate clients that have allowed us to grow with you! Get 10% off your next class! Language Factory 2018. All rights reserved.